Chris McCully was born in Bradford, Yorkshire in 1958. Educated at Malsis and Bootham, he took a first-class degree in English Language (Newcastle-upon-Tyne, 1982) and went on to complete a doctorate at the University of Manchester in 1988. For many years Chris continued to work in the Department of English at Manchester, specialising in teaching and research on language-related topics, particularly poetic form, poetic history, English phonology, morphology, and metrical structure. 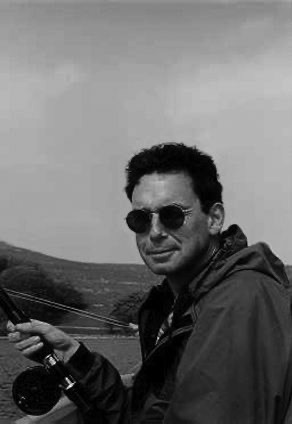 During the 1980s and 90s Chris authored, edited or co-authored collections of poems; essays; a fragment of angling autobiography (that ended up as fiction); a textbook on metrical theory; a dictionary of fly-fishing; conference proceedings . . . and continued producing academic papers, essays, reviews, and angling features. Some of this work appeared in two journals with which Chris has long been associated, PN Review and Trout and Salmon. Chris also engaged in at least one lecture tour across the USA, and gave poetry readings, papers and talks in the USA, Spain, Poland, Finland, Japan, Canada, France, Germany . . . and, once, somewhere near Peterborough. In 2003 Chris gave up full-time academic work in order to develop a career as a writer. He's still not quite sure whether that was wise, but continues to produce the same range of work - indeed, a wider range, from alcoholism to Ezra Pound's lineation in the Cantos; from the structure and design of pike streamers to the phenomenon of garden gnomes; from level-ordered morphology to underwear. In 2003 Chris was granted the title of Honorary Senior Research Fellow, Faculty of Arts, University of Manchester, and runs the Modern Literary Archives Programme at the Rylands in Manchester with Michael Schmidt and Rachel Beckett. He also taught part-time in the Department of English at the Rijksuniversiteit Groningen for many years and gave a range of training courses on different aspects of writing in the English language.